UFO SIGHTINGS DAILY: Analysis of Stanley Kubrick Confesses To Faking The Apollo Moon Landings, Video, UFO Sighting News. 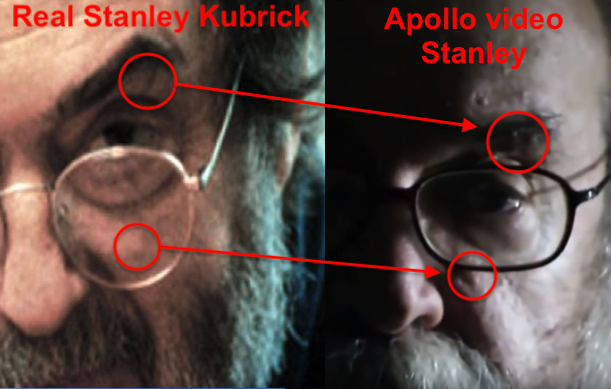 Analysis of Stanley Kubrick Confesses To Faking The Apollo Moon Landings, Video, UFO Sighting News. Hey everyone. I have tweeted Tom Cruise to ask him to verify if this video below is truly Stanley Kubrick. Since they made a movie just before his death together, I believe Tom could clear this up for us. Lots of regular joes are calling the video a fake, but I have done some analysis of my own of the video and found the following. 1. Resonance (grating vibration) is same in both videos. 2. His voice is slightly higher pitch than others. 3. His hesitations...which are common of him in both videos when speaking. 4. Vocal Inflections are the same. Meaning his voice rises and lowers in the same places in the sentences. Also there are photo similarities that are interesting. 1. Both wear glasses, but different types. 2. Both have a receding hairline and beard. 3. Both have matching skin bumps. 4. Both have matching scars between eye lid and brow. 5. Both have bags under and over eyes. It is my professional opinion that this video of Stanley Kubrick admitting to the moon landings is 100% real. Watch the videos below and compare and contrast for yourself. I also believe that the US gov has spent a lot to time and money on leaving fake comments on Youtube and other sites calling this video a fake in order to control the public perspective of it. This video would be enough evidence in a court of law to convict NASA of lying to the USA and to the world.